Beyond white we can offer conservatories in a range of foiled finishes from rich woodgrains to period and contemporary colours, all with extended warranties. While the traditional colour for a conservatory is white we can offer more in the way of choice, including a whitegrain finish helping to replicate the finish of painted timber, which is proving particularly popular. All the materials for the windows, doors and conservatory roof are manufactured with an exact matching foiled finish of your choice, while other elements of the conservatory roof are perfectly colour matched. 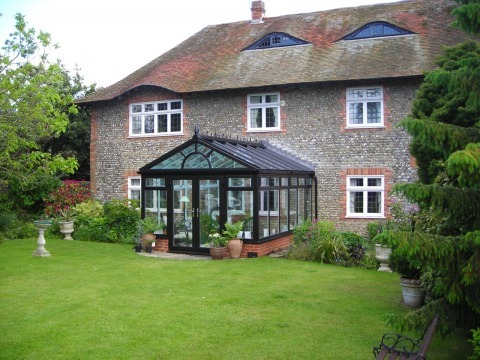 With thousands of foiled conservatories across the UK, you can be reassured that they will offer a life expectancy well in excess of 30 years, needing just an occasional squirt of light oil on the handles and hinges. They have also been designed and engineered to withstand the harshest of climatic conditions from coastal areas to the more mountainous parts of the UK. We take a look at your property and consider the existing window colour, brickwork and conservatory design. Our foiled white finish is designed to replicate the look and feel of painted timber and it looks great! 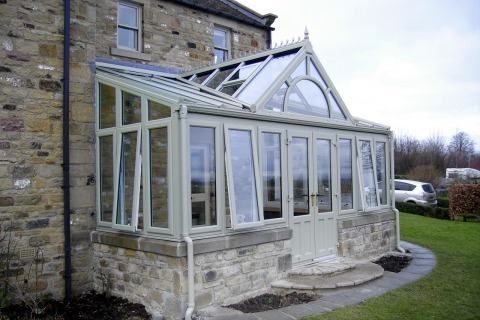 Our cream finish looks beautiful on a conservatory or GardenRoom, particularly with stone brickwork. This is an exact match to everyone’s favourite period colour – Chartwell Green. As an alternative darker colour this shade of green is distinctive and perfect in a garden packed with trees and bushes. Arguably the best contemporary colour in the range and can be matched with similar bi-folding doors and windows. This is equally applicable on modern and traditional homes and can also be matched with white for a Tudor look. Our luxurious Residence 9 conservatory is available in a range of exclusive and lifelike foils with new woodgrains, along with period greens and contemporary greys. There’s also the option of a different colour inside and out. With Residence 9 anything is possible! With a traditional R9 window this perfectly replicates painted timber as any time-served joiner will tell you. Inspired by the Cotswolds, this exciting new colour is designed to complement any stone finsh. Don’t want the cleanliness of white or the yellow in Cotswold Biscuit then this is a perfect compromise. This is the ultimate period colour inspired by the likes of Farrow &amp; Ball with their Chartwell Green. This is the first colour of its kind and is a period blend of subtle green and grey. This is a true traditional oak finish that takes into account of our love off all things timber. A slightly darker oak finish and common in Ireland this rich timber finish is becoming ever more popular. A sample of this finish has to be seen, it’s unique, deep and rich finish is something to really catch your eye. Another variation on an oak finish, but with a warmer edge to it. Our customers have been asking for this! This is our dark timber finish that carries a touch of red within the detailed grains and a far better alternative than mahogany. This is arguably our most popular and striking contemporary colour and for good reason. Inspired by No 10, this shade of black is deep and rich and perfect on period properties. This is a mid-grey finish and another popular contemporary finish for the modern home. If one of our many foiled finishes isn’t quite what you are looking for then we can produce a custom and individual colour for your conservatory, however wacky! We have our own in-house painting facility that harnesses the acrylic paint technology from the automotive industries to provide lasting performance against cracking and blistering, as it’s the same technology used on car bumpers. Some homeowners may want to match their new conservatory with their furnishings, windows or for a multitude of other reasons. Colours can make a huge difference to your conservatory both inside and out, so if you do want something a little more exclusive and individual then yes, we can do it. A conservatory is a personal investment after all.